The CoolPro CATHODIC CONVERTER™ is an efficient and reliable high current DC-DC converter with an integrated Impressed Current Cathodic Protection (ICCP) controller, ideal for use in remote solar powered applications. The converter’s highly efficient design reduces component operating temperature and thermal cycling, prolonging the lifetime of the unit, even when deployed in the most extreme temperatures. Combined with a durable weatherproof enclosure, the CoolPro is an excellent choice for the harsh environments in which cathodic protection is often deployed. 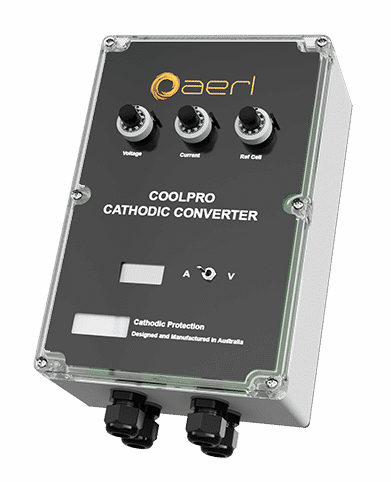 The AERL CoolPro can also be operated in parallel, as a cost effective solution to protect even the largest metallic structure. 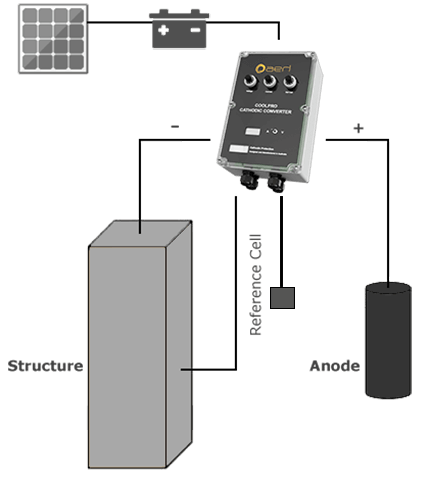 Optional extras such as automatic Reference Cell Control and the AERL “Surge Buster” help to protect your investment and get the most out of your corrosion protection system. Need more information? We’re happy to help. You can reach one of our sales staff between the hours of 8:30am – 5pm AEST, Monday to Friday. Get in touch with our sales team anytime at the address above, or simply use the form to the left.